Last spring at the beginning of the semester, one of my online Eng. 111 students wasn’t logging into Moodle or responding to my emails. If he didn’t get started soon, he’d be a week behind. I pulled his transcript, saw that he was a dual-enrolled student from Kalkaska, and called his high school counselor. Within 45 minutes, the student and his dad were sitting in my office working out a plan to get caught up. The student finished the semester with flying colors. Most of our high school students are self-directed and successful, but some need extra help meeting college expectations, especially in online classes. By working with either high school counselors or our admissions staff, we can help nudge our high school students back on track. Attached is a flowchart showing the steps for finding the appropriate counselor, along with contact information for all the counselors at our feeder high schools. Both were prepared by Ann Hosler, the student worker for the Communications Area. 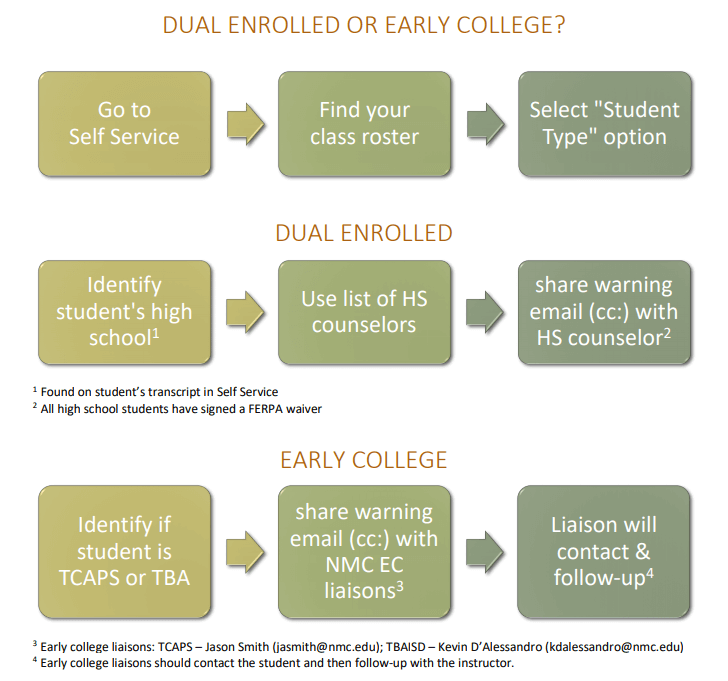 As you’ll see, the first step is determining whether your student is Early College or dual-enrolled. NMC admissions folks are the best contacts for Early College students, as both our admissions and counseling staff work closely with this cohort group. Dual-enrolled students come to us individually, but with full FERPA release so we can discuss their situations with high school counselors. Ann’s list includes email addresses because that is often the best way to contact high school counselors. If you are writing a “time-to-get-serious” email to a high school student, all you need to do is cc: their high school counselor or admissions advisor. I have done this many times and have almost always gotten a quick response from the student and a message from the counselor/advisor thanking me for the information. Thank you, as always, for all the ways you help our students succeed!